At Oakley Signs & Graphics, we supply real estate signs and innovative display marketing products to real estate agents throughout North America. A leader in the industry since 1972, we maintain manufacturing facilities Chicago, Illinois and a corporate headquarters in Orlando, Florida. 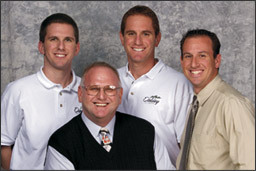 Brett Levitt, Ken Levitt, Scott Levitt, & Keith Levitt. Oakley Signs & Graphics is operated at the senior level by the Levitt family. Ken, Scott, Keith, and Brett work together each day to create a company where everyone has the opportunity to thrive and contribute to a shared vision. Scott Levitt is CEO. Ken works with Keith in client service and sales, while Brett manages our factory in Chicago. We view our team members as family. From the voices you hear in our customer loyalty team call center to the employees perfecting your signs on the factory floor, we're all dedicated to our customers' satisfaction. Real estate is a complex business where relationships matter. The team at Oakley specializes in understanding the unique requirements of real estate marketing and the level of personal service agents have come to expect. If you're truly curious about what makes Oakley more than a B2B real estate sign supplier, we invite you to have a look at our core values. These ten core values drive all of our decisions and form the foundation of our company culture. We believe in building teams of qualified people who share our company values. Skills can be developed, but attitudes and beliefs are much more fundamental to our collective success. Oakley Signs & Graphics also helps agents succeed "beyond the sign." Each week we publish the Tuesday Tactics Newsletter, a free resource of tech, marketing, and coaching tips. Thousands of agents turn to us each week for advice on how to grow their business. We also create original relationship marketing materials for agents and brokers at My Real Helper, a real estate relationship marketing content service designed to help agents market themselves and build rapport with clients. Our newest venture is Oakley Canvas Prints, where we transform the images you cherish into works of art to hang on your wall. If you enjoy the excellent service and superior pricing provided by Oakley Signs & Graphics, you'll be glad to know the same team is behind Oakley Canvas Prints. We stand by every canvas we print and order we ship with the same high standards. We're eager for the opportunity to earn your loyalty and form a lifelong relationship in support of your business. If you have any questions you can contact us online or by phone and connect with us on Facebook. Browse past articles from Tuesday Tactics on our blog and catch up with this week's edition of our newsletter online. Finally, we invite you to become an Oakley Signs & Graphics customer by shopping online with our current special offer.